I try very hard to take beautiful pictures for Blake Makes. We’ve cooked a lot of stuff for the blog (and of course we eat every night), but if it doesn’t look good, I don’t post it. I broke that rule tonight because this is pot roast. 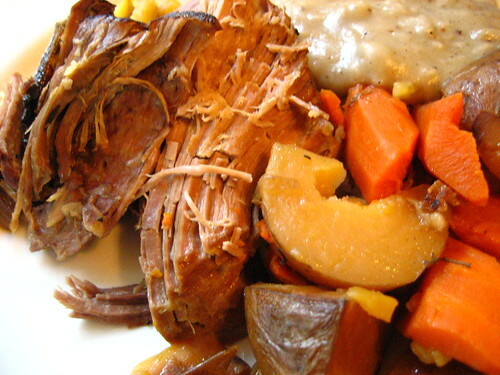 Maybe pot roast isn’t meant to be pretty, but it’s so good. I don’t think you can screw it up either. I season a big roast with tons of Kosher salt and black pepper. I heat a pan (not non-stick) to blazing, rub the roast with a little oil, and SEAR! This is just to seal it, so get a nice crust on all sides (and the ends). Next, I throw it in my crock pot with some potatoe, onions and carrots. I also toss in a few sprigs of thyme. Cook it all day. It’s ready when you get home from work (and to nibble at over lunch). I know it’s redundant, but we serve it over rice. Tuck in.